July 27, 2018 5:38 P.M.
PARRY SOUND — Premier Doug Ford visited people in communities near Parry Sound where hundreds of firefighters from across North America are battling major wildfires. 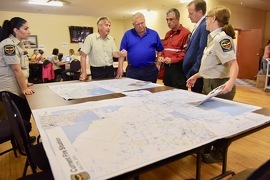 The Premier, accompanied by Jeff Yurek, Minister of Natural Resources and Forestry, and Norm Miller, MPP Parry Sound-Muskoka, met with people in the affected communities today, as well as with teams that are fighting the fires and managing the evacuation process. The government's priority is to keep the public and emergency responders safe, and to protect private property. "It's a terrible thing to have to flee your home because of a forest fire," said Premier Ford. "These fires have shown how communities in Ontario come together in times of need. Our government is doing everything we can to bring these fires under control and keep you safe." 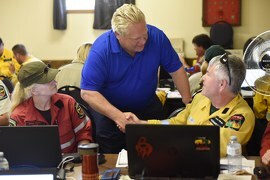 The Premier praised forest fire teams that are working with the Ontario Provincial Police, community leaders and other agencies to battle fires in the Parry Sound area and other parts of the province. As well, he recognized the help Ontario is receiving from beyond its borders. "I want to thank all of the courageous men and women from near and far for helping us respond to this emergency," said Ford. "And I am grateful to the premiers of provinces that are helping Ontario, as well as leaders in the U.S. and Mexico who are providing assistance. We are working side by side as one united community."